Simply Silhouette: Here we come a Caroling! We all have our songs playing on our blogs. tree branches on it using my Martha Stewart branch punch. I added my little rockin' Elf that I cut from my Jolly Holidays Cartridge. 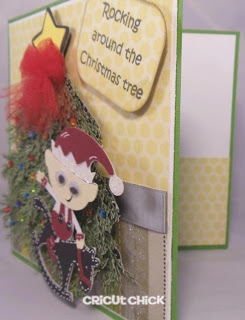 Cardz TV Stamps set called "Holly Jolly"
below and start singing along ! This is adorable. I really like how you made the tree. I am honoured to be in this blog hop with you. Love love love this, he is so cute and that tree is amazing!!! That tree is amazing! I love it! 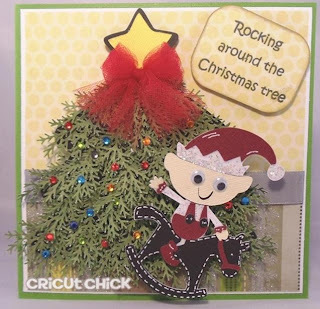 That cute little elf can sure rock around that adorable tree. 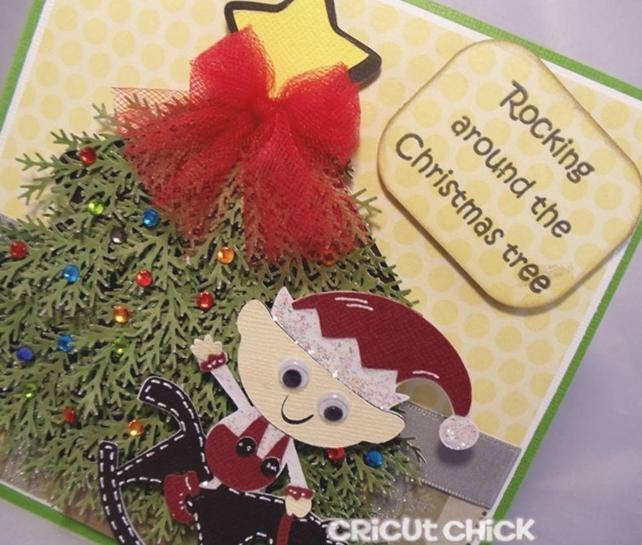 And I love the big red bow..This card is so cute (amazing how you made the tree ) very well done.. I love this card and I am going to scraplift it! I never know what to do with this punch! That little elf is so cute and I am going to be singing this song in my head all day! Adorable. I think I'm going to have to buy that branch punch, I've seen so many neat projects with it and it is so realistic looking! Julie such a pretty card I Love all the details on the christmas tree. Awesome work. Wow, Julie, your tree is amazing!!! beautiful! OMG...this is just too cute! I love your tree! Super cute card. I love the elf you used. He is so adorable. Thanks for the hop. 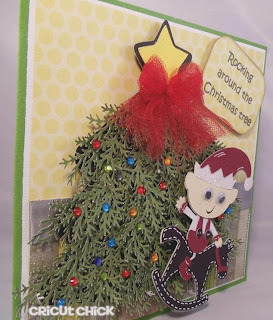 What a cute card I love how you did the tree. This is fabulous. Amazing..your tree blew me away! Thanks for the inspiration and I love this cartridge too. This is beyond cute!! Great job! Another cartridge for me to get...lol...love it! You fun group have got me into the Christmas spirit. I just adore this super cute card. I am so eager to have the cart that does that elf. How did you do the rocking horse? 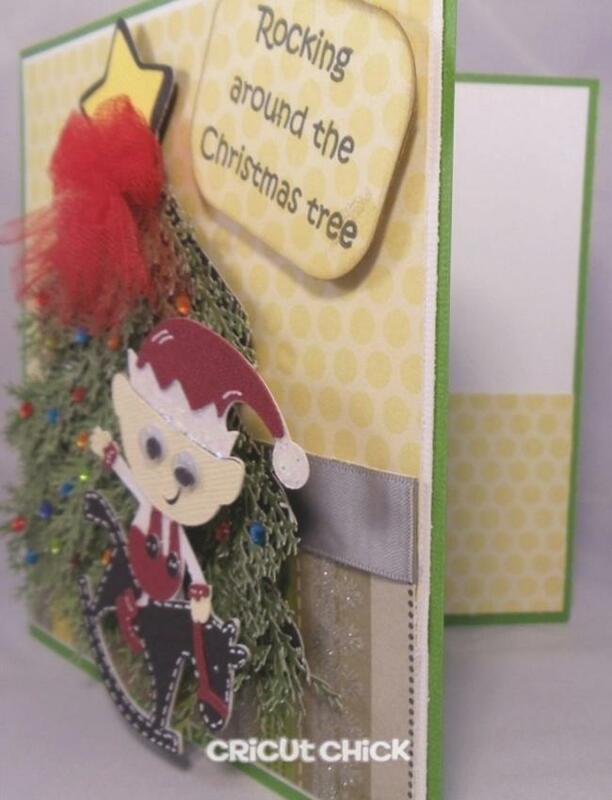 Oh My goodness love your card great idea on using the martha stewart punch for a christmas tree. looks great with the little elf you rocked this card. OMGoodness Julie! love all your work paid off!!... I am still looking for that punch!! That's a really clever idea on the tree! Never seen one made with the punch but brilliant idea! Cute with the Carl you chose! Very well thought out! Love it! Wow! Wonderful card. Love the tree you made! Love all the layers and texture. Your tree looks so real. Oh my word, your card is too cute!!! I just love how you created your tree.. It was such a pleasure being in this hop with you..
Julie this is sooo cute!!! OMG!!!!!!!!!!!!! That card is the cutest!!!!!!!!!!!!!!!! I love the Christmas music! Thanks for getting me into the spirit for some Christmas creating I need to do today!